When you consider losing weight, fruits are always a good option for your health. Some health conscious people prefer strict diet plans in order to reduce extra fat from your body, some go through tough exercises to get rid of the fat. But, following a healthy diet can also be a way to shed weight, especially adding fruit to your diet chart that stimulates the fat burning process. In India, people follow different diet plans and fruits take a large place in their diet as it serves both taste and the weight loss purpose. Generally, fruits are nutrient loaded, which delivers essential health benefits to your body. 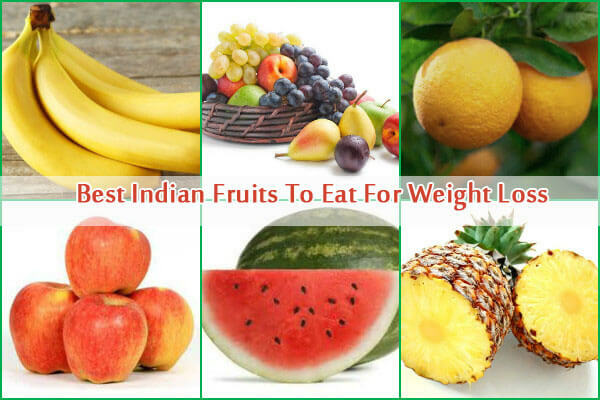 The content deals with the top ten 10 Indian fruits that help in losing weight. The best thing in this fruit is it comes with no cholesterol and fat that give a great support in slimming down your shape. Besides this, it is a great source of nutrients, antioxidants, vitamins and different minerals, including calcium, manganese, potassium and so on. Generally, it contains 85% water, which controls your fluid intake and along with that it makes you full for a long time. It helps in preventing water retention from your body. This fruit suppresses your appetite that goes with your weight losing factor. Watermelon is also a popular Indian fruit that comes with a great benefit over your weight. It does not contain any fat and apart from this it delivers plenty of water to your body. Watermelon is also a great source of vitamin A and C that proves helpful in reducing weight. It is a watery food and trimming down your shape, it plays an important role. Watermelon helps in reducing your water weight. It also lowers your appetite and suppresses your hunger. Banana contains soluble starches that in turn improve your fat burning process. In order to lose weight, you should have an improved fat burning process that a banana can do. It is true that the more you burn your fat, the more you can get energy so in being active, you need to include banana in your diet. It also deals with the constipation problem. Banana generally works as an appetite suppressor. It improves your energy so that you can extend your workout routine to lose weight. Apples serve your demand of losing weight. It comes with a great source of fiber, which is considered an essential nutrient in reducing your weight. Other than this, apples are low in calorie and sodium, which also improves your fat burning factor. It also takes part in burning down the calories. As it contains fiber, it can make you full for a long time that helps in reducing frequent food cravings. It also helps in draining out the excessive water from your body. You can include oranges in your diet while you are on a weight losing process. Orange contains low calorie, which is essential for weight losing. Along with that, it also contains some vitamins that improve your fat burning process. It controls fluid intake in your body that prevent water weight. Orange helps in fat burning process to cut down your fat. Lemon is such a fruit that Indians are frequently used in the dishes. Lemon juice with other natural compound work as a medicine in your weight loss process, especially honey and ginger. It helps in cleansing your system, which in turn improves your fat burning process. It contains vitamin C, B and essential minerals including phosphorous, calcium and magnesium contribute in weight losing process in different ways. Berries are a good source of vitamins, minerals and water that give you lots of benefits in your weight losing process. You can eat raspberries, blueberries and strawberries to absorb the essential nutrients that stimulate your inner functions. It contains fiber that keeps you full for a long time. The antioxidant presents in berries help in the detoxification process. The low calorie food goes with your weight loss diet. This fruit is a very much Indian food and it was first introduced by the Portuguese. Guava carries fiber and other than this, it also contains essential nutrient that lowers diabetes issues. It improves your bowel movement that in turn loses your weight. Grapes come with weight losing benefits as it contains fiber, antioxidant, vitamin C, potassium and many other nutrients. This fruit also carries low calorie that let you include grapes in your diet. While choosing for the weight loss benefits, buy the red ones because of its healthy nutrients. Antioxidant drains out toxin from the body that in turn helps in reducing fat. Fiber controls your digestion that reduces your food hunger. Though we make mistakes thinking tomato falls in the vegetable category, but the truth is that it is a fruit. It contains high level of antioxidants and it prevents storing water weight. Antioxidant helps in the detoxification process.